South African President Cyril Ramaphosa yesterday said his country will support Zimbabwe's economic growth and reform efforts and called on the West to remove all sanctions imposed on Zimbabwe immediately to allow unhindered recovery. Giving his remarks during the official opening and closing ceremony of the third session of the Zimbabwe-South Africa Bi-National Commission (BNC) in Harare, President Ramaphosa said his government demanded more than just piecemeal lifting of sanctions. He said the reform efforts being undertaken by President Mnangagwa's administration were on point and deserved the support of everyone. "We commend your new administration for all your efforts through your programme of action to take Zimbabwe out of its current difficulties and make it a viable partner to South Africa, to the region and other development partners," President Ramaphosa said. "In support of your commendable efforts in February this year at the World Economic Forum, South Africa made a clarion call to the international community to assist Zimbabwe and support the reform efforts that your Government has embarked on by lifting the unfair and unjustified sanctions that have been imposed on Zimbabwe. We even addressed the European Union and made this call. We are pleased that the EU heeded the call and in February 2019 decided to lift sanctions on the current members of your administration but we want more than just that!" He added: "We are very clear as South Africa that the sanctions are unjust, unfair and the time has come for them to be lifted immediately because they impede the growth of the Zimbabwean economy and they also have an adverse effect on the ordinary people of Zimbabwe. We want these sanctions lifted yesterday. We want to see meaningful support being given by the international development partners to Zimbabwe because Zimbabwe does deserve the support that the world can give. This is the first of the many steps needed to support Zimbabwe's recovery." In response, President Mnangagwa said despite being on sanctions for nearly two decades, Zimbabwe was using domestic resources to resuscitate, grow and modernise its economy. "We as Zimbabwe and in particular under the Second Republic we have said to ourselves yes we want the sanctions, which are unjust and illegal, to be removed yesterday but we will not bury our heads in the sand and cry," he said. "We are determined to use our domestic resources to grow our economy. We are happy that our sister member states in Sadc are in full support of our endeavour to modernise our economy in pursuit of the industrialisation policy of Sadc. But to do that we don't have both the skills and technology nor capital to implement our vision. Therefore, we appeal through our engagement and re-engagement approach to the member states of the world family of nations to engage with us so that we may access global capital to exploit opportunities in our economy." President Mnangagwa said through its Transitional Stabilisation Programme, Zimbabwe was implementing tough "unpalatable" decisions. These hard-hitting decisions, he said, would see Government springing from economic stagnation. "To instil confidence in our economic landscape we are enforcing fiscal discipline, stabilising the macro-economic fundamentals, aligning our laws to the Constitution and entrenching the rule of law," he said. "The creation of an environment which welcomes business and investments from both local and international investors remains high on our agenda." President Mnangagwa said to record desired results, Zimbabwe needed help from countries like South Africa. "We must, therefore, continue to work closely together, hand in hand, as we journey towards the progress and prosperity our people yearn for and indeed deserve," he said. "Your outspoken support for the new Zimbabwe is not taken for granted. You understand that our success is your success. You have stood by us in solidarity. I exhort our two countries to continue to ward off the machinations of those who wish to break our strong ties. While our friends are many and their efforts appreciated; our detractors, on the other hand, are tireless and unrelenting in their ill intentions." The President said investments in Zimbabwe were secure and any challenges faced by investors will be addressed efficiently. 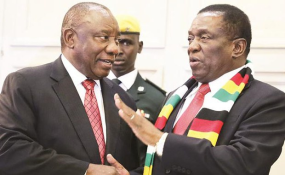 The conclusion of the Zimbabwe- South Africa BNC comes barely two weeks after Zimbabwe had a similar convention with its western neighbour, Botswana, solidifying President Mnangagwa's growing influence in the region and beyond. President Ramaphosa flew back yesterday evening.